With National Barbecue Month in the works and Memorial Day on the way, it’s time to start firing up the grill and enjoying some fresh air with your closest friends and family. How can you improve your outdoor entertainment and keep the party going well into the night? 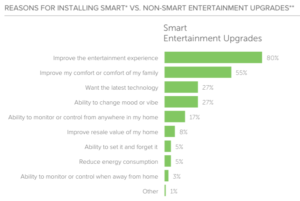 According to a recent Houzz study on smart home trends, the areas most upgraded in the home, whether indoor or outdoor, were lighting, climate control, security/safety and entertainment. Taking advantage of home automation outdoors with smart lighting can make a seamless transition as the sun sets and can help set the mood as the party winds down. Other summer projects outdoors include installing smart TVs around the pool or deck and installing wireless speakers for whole home audio. 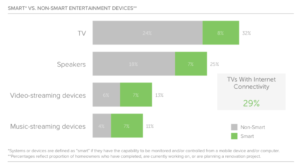 These projects are the top two choices for entertainment upgrades in the home. 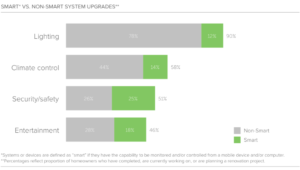 While you may consider installing non-smart TVs and/or speakers instead, Houzz offers insight into why homeowners choose smart devices instead, including to improve the experience, improve comfort, have the latest technology and change the mood or vibe at any time. If you’re interested in firing up the grill and enjoying the outdoors in style this summer, let us know! During your free scheduled appointment, we can walk through your ideas and offer expertise on devices that will work best for your needs as well as the proper placement of your new technology. 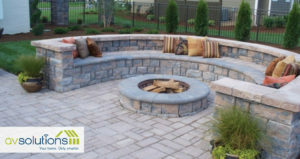 Schedule your free appointment and get fired up about upcoming summer projects!